On Nov. 6, there's a very real possibility that many Americans with disabilities will not be able to vote because their local polling places will be inaccessible. Advocates for the disabled are worried that local governments aren't doing enough to prepare -- as are some of the small businesses that outfit polling sites with ramps. Julian Gordon has similar concerns. Gordon is the founder of Amramp, a Boston-based ramp-rental company that has locations in 46 cities. More than 100 polling places will be using its services this year, he said. "Compared to last election, we could be doing about the same in business," he said. "What our franchisees are hearing is that in many places, money isn't being spent on buying or renting ramps for the polling sites." EZ-Access and Amramp are at the forefront of what the disability rights community says has become a persistent problem. According to a report from the Government Accountability Office, only 27.3% of polling places were fully accessible on Election Day 2008. The problems included a lack of steel ramps or curb cuts in the parking area, unpaved surfaces and 1/2- inch-high bumps in doorways. The main focus of the report was people who use wheelchairs, although it also chronicled some obstacles for visually-impaired voters. Federal law, including the Americans with Disabilities Act, requires polling places to be accessible to eligible voters for federal elections. And through the 2002 Help America Vote Act, states can get federal funds to improve polling center accessibility. Still, disability rights advocates say problems remain. Recent reports from the field are troubling, said Curt Decker, executive director of the National Disability Rights Network, which gets federal funding to conduct a national sampling of polling centers ahead of general elections. One example: "I've heard from our folks that some polling centers in Detroit are clearly inaccessible," Decker said. Mark Cody, legal director at NDRN's Michigan division, said his office recently found several Detroit polling facilities that "didn't even pass the eyeball" test of accessibility. The vast majority of 67 polling stations evaluated were found to be inaccessible during the Michigan primary in August; the test covered about a third of Detroit's polling centers. Janice Winfrey, city clerk for Detroit, said she and an election official visited all of the sites evaluated by Cody's office and determined that all met the minimum requirement by law to be accessible to voters with disabilities. 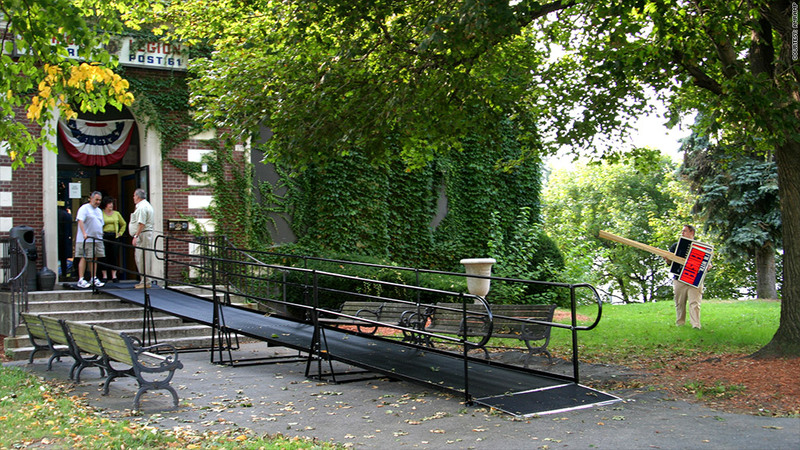 "Do they have the best [wheelchair] ramps? No. But they are there. The elevator in one site may not be in the best location, but it's there," Winfrey said. Advocates for the disabled in New York are also concerned. "For the past nine years, random samplings of New York City polling places have found many with a 70% to 80% barrier to access for individuals with disabilities," said Julia Pinover, an attorney with nonprofit group Disability Rights Advocates. The New York City Board of Elections told CNNMoney that it has determined that 57 of its 1,255 polling sites do not meet ADA standards. Among other things, it is mailing letters to offer voters at those 57 sites the option of transferring their registration to nearby sites that are accessible. Advocates, as well as the small business people working in the field, say officials often cite a lack of funding as the reason more polling stations aren't accessible. According to the U.S. Election Assistance Commission, Congress gave states about $3.25 billion from 2003 until 2010 to improve the voting process, the vast amount of which was for purchasing fully accessible voting equipment and computerized statewide voter registration lists. But a very small piece of that funding was made available to make polling centers themselves accessible. Doug Lewis, executive director of the National Association of Election Officials, said polling center accessibility is better today than in the past. "But are we fully compliant with the law all over the country? No," he said. "There is a money crunch right now. When that happens, progress stops."